Faiz E Aam Secondary School, (A Unit of Darul Uloom Raheemiyyah Bandipora) again brought laurels to the whole district in general and to the faculty, administrative staff and whole Darul Uloom Raheemiyyah in particular. Here is the glimpse of the result declared by State Board of Education Jammu and Kashmir. Faiz-e-aam Secondary School Bandipora run by Daarul-Uloom Raheemiyyah Bandipora Kashmir has got the crowning glory in district Bandipora in the class 10th results of 2017 declared by Jammu & Kashmir State Board of School Education (JKBOSE) on Tuesday 09 January 2018. The said exams were conducted in November-December 2017. 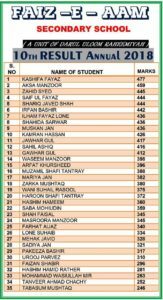 Among the appeared students of Faiz-e-aam School in the 10th class exams, first ten students are at the top of the grade and have got distinctions in these exams. Moreover, eleven (11) students of Faiz-e-aam have qualified these exams with the first division. And the remaining students of Faiz-e-aam School, appeared in the said exams of the 10th class, have also managed to qualify. As soon as the great news of excellent performance by the students of Faiz-e-aam School Bandipora in the 10th class exams broke, the messages of congratulations began to pour in from all quarters. First of all, the people congratulated the Honourable Chancellor of the Islaamic varsity, that is, Daarul-Uloom Raheemiyyah Bandipora Kashmir, Hazrat Maulana Muhammad Rahmatullaah Sahib Qaasmi Daamat-barakatuhum, on excelling all the departments and offshoots of Daarul-Uloom Raheemiyyah Bandipora as Faiz-e-aam Secondary School is one of the offshoots of the Raheemiyyah varsity Bandipora. “It is a matter of joy and gratitude that the contemporary education being imparted at Faiz-e-aam School is excelling in the same way as the Islamic studies at Daarul-Uloom Raheemiyyah Bandipora is excelling year by year, and both the academic sectors of the Raheemiyyah varsity are excelling under the dynamic leadership of Hazrat Maulana Muhammad Rahmatullaah Sahib Qaasmi Daamat-barakatuhum,” the civil society members asserted. On performing well in the 10th class exams, Parents of the successful students have felicitated the Esteemed Chairman of Faiz-e-aam Secondary School, Hazrat Maulana Hameedullaah Mir Sahib, and have described him as a very hard-working and careful head. “The respected staff of Faiz-e-aam School are truly appreciated for their dedication and outstanding performance at the school,” the parents of the students commented. Responding to the felicitations and comments of the parents of Faiz-e-aam School students and the civil society which they expressed on the declaration of the 10th class results of Faiz-e-aam Secondary School with flying colours, the Honourbale Chancellor of the Raheemiyyah varsity, Hazrat Maulana Muhammad Rahmatullaah Sahib Qaasmi Daamat-barakatuhum, said that by the grace of Allaahu-Ta’ala Jalla-shanuhu first and then by dint of support, solidarity and supplications from the Muslim community of the state, Daarul-Uloom Raheemiyyah and Faiz-e-aam Secondary School are forwarding their noble cause smoothly and both have built up a very impressive reputation for quality.